This Oct. 23, 2018, photo shows HealthCare.gov website on a computer screen in New York. More people had health insurance from 2013 to 2017 across the nation, including every state and almost every county. 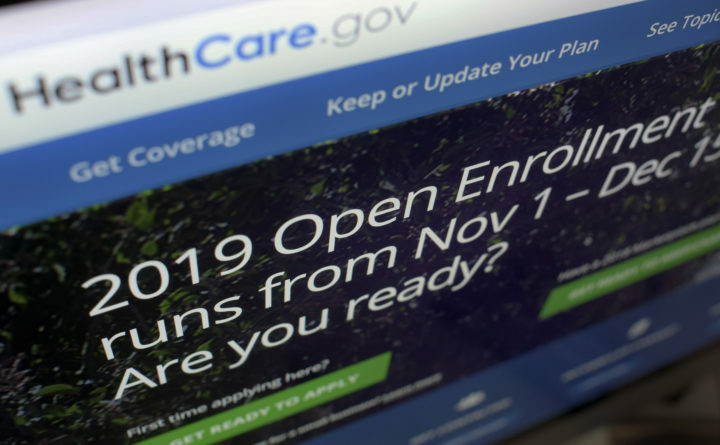 In Maine as a whole, 10.2 percent of the population younger than 65 was not insured in 2017, according to the U.S. Census Bureau, which used data from Small Area Health Insurance Estimates. That’s about 100,000 people, down 3.2 percent since 2013. Of Maine’s 16 counties, those that are mostly or totally rural saw the percentage of uninsured residents decrease from 2013 to 2017. Piscataquis County, for example, saw its uninsured rate drop 4.2 percent to 12.2 percent over that time span. The Census Bureau listed that county as 100 percent rural. Washington County, also classified as 100 percent rural, saw its uninsured rate fall 2.9 percent to 15.6 percent in 2017. Aroostook County, listed as 90.3 percent rural, had an 11.8 percent uninsured rate, down 3.9 percent since 2013. Cumberland County, which is mostly urban, has a 9.2 percent uninsured rate in 2017, down 2.5 percent since 2013. Penobscot County saw a 3.3 percent decline in uninsured over the time period to 10.9 percent in 2017. More residents of rural counties still lack insurance than those in urban areas, the Census Bureau said. Nationally, an average of 12.3 percent of residents in completely rural counties did not have insurance while 10.1 percent of those in mostly urban counties lacked insurance. Norfolk County in Massachusetts, just south of Boston, had the lowest percentage of uninsured in the nation at 2.3 percent. Gaines County, Texas, had the most uninsured at 33.7 percent. To look up your county, see the interactive graphic on the U.S. Census Bureau website.